Horror comics are becoming more and more frequent in our reading culture, and the Ghastly Awards are here to recognize, through Horror Comic submissions, those that shine the brightest. 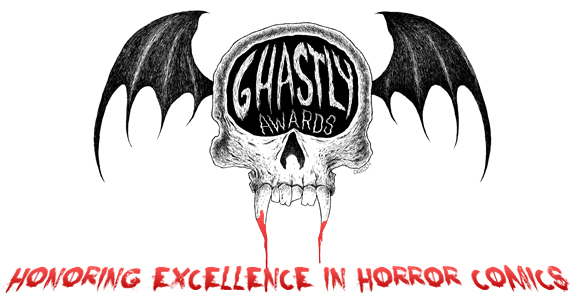 We encourage all Comic Creators to take the time to head over to www.ghastlyawards.com and submit your work for 2013 Ghastly Award Nomination consideration. LUS† (44FLOOD) - When I read Warren Ellis' Foreword for LUS† I thought to myself, "This... is money well spent. I wouldn't even have to turn another page and I'd be completely satisfied." We are never more lonely than when in a state of lust. In our need we are exposed, a little animal paralysed by a want for a touch that comes from elsewhere... Ellis said, Lust makes us feel farther apart from others than any other experience... Lust is that moment when we are most alone and closest to the final murder of our heart. Ellis' words so eloquently, horrifyingly, and gut-wrenchingly illustrate how reading LUS† made me feel. When Niles writes with Templesmith it's like hot butter. It's so smooth and consistent. The tone and style of Niles and Templesmith just melt into one and become this deliciously gooey, crazy fucked up, thrill ride. But it's consistent and you know you can expect something campy, gory, terrifying, and satisfying. When Niles writes with Menton, there is a daring dance between art and text. I found it to be exhilarating and very well done. Both art and text jumped us from one surge to another and back and... it's a darker, more vixen, red lipstick type of prose than with Templesmith. Despite these two different styles of storytelling, the story came through and gave us an intimate look into chastity and lust. I'd be remiss if I forgot to acknowledge Menton's art and how so very damn terrifying and beautiful it is. It's luscious in a Sharon-Tate-soaked-in-black-tar sort of way. Shock. Awe-inspiring. Fuckable. Fashion. Terror. Forbidden. Confused... I could spend all day listing the feelings I feel when I spend time with Menton3 in LUS†.